The endless flat region in the south-eastern corner of the Great Hungarian Plain is crossed by several rivers (the rivers Körös, Maros and Berettyó). The settlements are mostly established on the banks of these rivers. In the almost perfectly flat areas of county Békés a number of towns await visitors. The banks of the rivers Körös were inhabited as early as the prehistoric times. The collection of findings which includes personal belongings of the people living in the 5th and 4th centuries B.C. 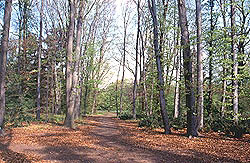 is called Körös culture by archaeologists. According to mediaeval records, the people living here founded tiny settlements in the area, but after the Turkish occupation the region became uninhabited. In the 18th century the population was resettled, settlers were called from the surrounding countries - as a result, the county is still characterised by a variety of nationalities and cultures. Békéscsaba is often referred to as the capital of Viharsarok (storm corner). 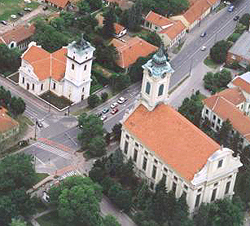 The town became the county seat due to the fact that Hungary lost the large towns in the south-east (Arad, Nagyvárad) after the Treaty of Trianon. Painter Mihály Munkácsy spent his childhood in the town. To commemorate this fact, a memorial house was founded, where 21 of his paintings are presented including the work called Merengő nő (Contemplating woman). The Meseház (Tale House) was established by artist Mihály Schéner. His statues, gingerbread figures and drawings can be seen in the building complex consisting of two cottages, where folk art exhibitions and handcrafts workshops for children are held. The first economic school of Europe was founded by Sámuel Tessedik in Szarvas. The town is also famous for the Botanical Garden, where you can see protected, rare plants such as yewtrees, maidenhair trees, Japonicas, palm lilies, American sweetgums, rare oak and mammoth trees. 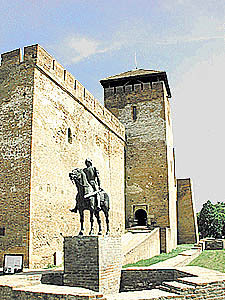 The castle of Gyula is the only intact brick castle of Hungary, its palace and the chapel are unique Gothic relics. The Castle Theatre of Gyula has been awaiting visitors for more than forty years every summer with performances in the closed courtyard with excellent acoustics. The county has thermal water, as well: e.g. the Castle Bath of Gyula was built in the protected environment of the former count's mansion. Painter István Doma-Mikó, who was born in Füzesgyarmat and now is living in Japan, established the first and single Japanese Museum of Hungary in his home town. Every year a Japanese Festival is held here. The studfarm of Mezőhegyes was founded in the 18th century, originally for military purposes. It had Lipizzan and Arab horses, and a new species was born, too: the English halfbred of Mezőhegyes. Visitors can see the buildings of the director's offices and the triumphal arches made by famous architects (János Hild and József Jung). The region is famous for its meat products such as the sausages of Csaba and those of Gyula and the goose liver of Orosháza. The area of the river Hármas-Körös and its dead channels with their natural beauties are popular excursion and holiday spots.